The Saturday late in August the G.O. took off from work so we could celebrate our anniversary with a weekend away at Port Stephens has turned into three. Last weekend we had family matters to attend to, but this weekend is ours. What a novelty to share my Saturdays with the G.O… Normally I blog, walk, clean and grocery shop… a mixed bag of which I’d happily forgo clean and shop. This Sydney morning was too windy and pollen content too high to comfortably walk, so I checked out WordPress posts while we did a lick & a promise clean. Because the G.O. usually works Saturdays, I gave him the preference when choosing where to go, what to do, then from my own endless list filled in the gaps. 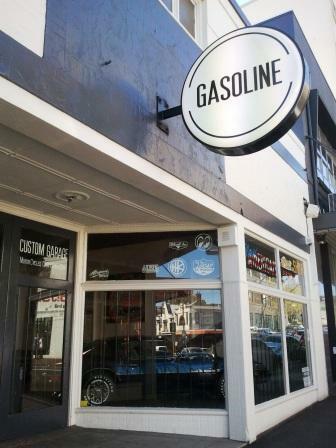 The G.O.’s first choice was his mate’s classic car & motorcycle import shop, Gasolene on Parramatta Road, at Camperdown. 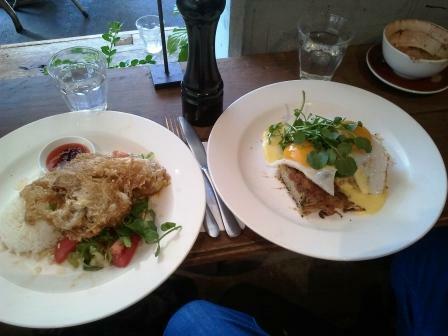 Agreeably, during the week I’d read a food article in the SMH re Thai Style Fried eggs w/ jasmine rice and nam jim at Runcible Spoon not far from there, so first item on the agenda was breakfast. Enroute, we’d realised we’d been to Runcible Spoon previously in pursuit of the Spanish Baked Eggs with harissa (still on the menu). Runcible Spoon is located just down the street from Deus Ex Machina. On to Gasolene, no-one was there but we had a squizzy at the merchandise through the windows. 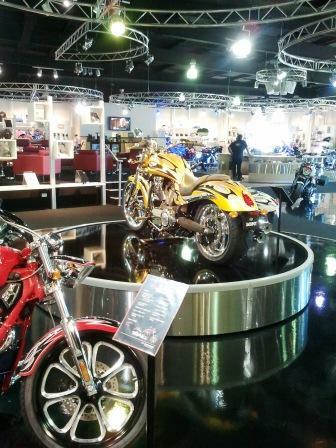 We moved on to Victory Motorcycles . 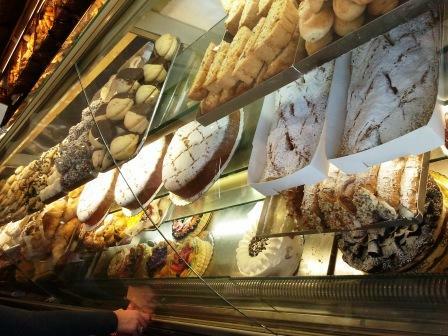 Done now with the G.O.’s agenda, our next destination was Haberfield with the promise of good coffee and Italian sweets at Papa Pasticceria. 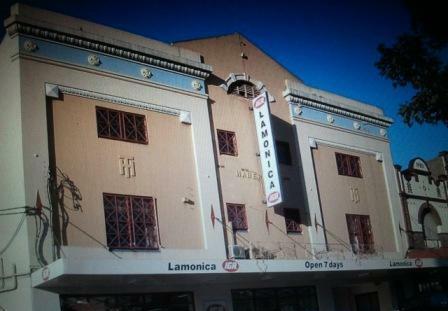 As we were in need of a top up of wine glasses we went to Lamonica Homewares. Finally, we couldn’t avoid the weekly grocery shop but at Lamonica IGA it’s a pleasure not a chore, and as well as the usual stuff we of course stocked up on Italian goodies. Although I can’t imagine these G.O.-at-home Saturdays will last for long, the G.O. has disclosed that today he omitted to include Extreme Toys, so I’ll keep my own to-do list prepared, just in case. 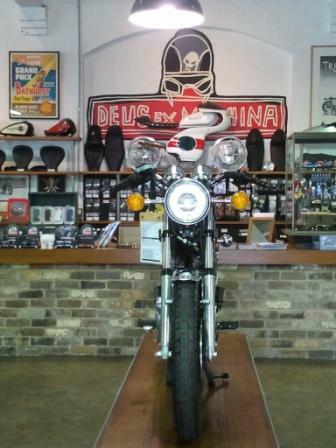 This entry was posted in Blog and tagged Australia, food, men's shed, motorcycles, my life. Most men are sentimental about their first car. The G.O. remembers his with fondness tinged with childhood trauma of tragic & violent loss. His pedal car, the same as the one in this photo taken on Australia Day at the NRMA Motorfest® of vintage, veteran & classic vehicles, and it’s memories: good – rattling along the farm track, and bad: it’s demise under the wheels of the milk lorry, brought both a smile to his dial and a tear to his eye. 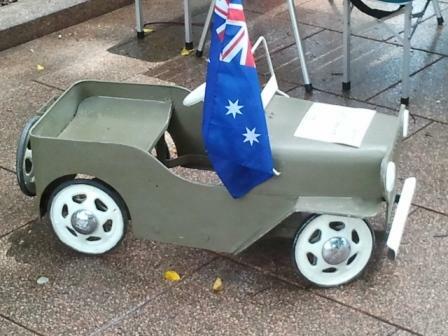 This entry was posted in Blog and tagged Australia, childhood, men's shed, my life, pedal car. The G.O. does love a motorcycle, and has a thing for sidecars so these oldies displayed in the front of Doust & Fitzgerald Ford Dealership, 14 Cudgery Street, Dorrigo, NSW, Australia got his attention & a spot on The Men’s Shed page. 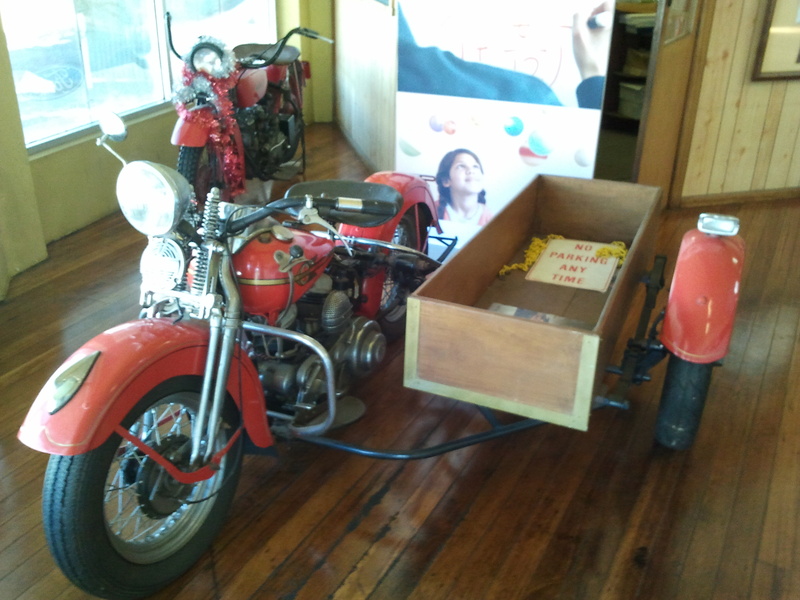 This entry was posted in Blog and tagged Australia, men's shed, motorcycle-sidecar. The things you see when your missus bribes you with a coffee stop for a luscious milky cappucino at your old friend Bobby’s Cafe on the way to do the grocery shopping… Given the location at downtown Darlington (close to Sydney University, NSW Australia). 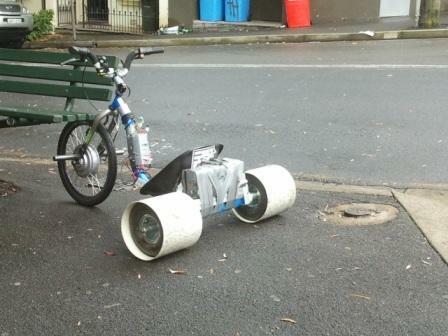 I’m thinking this rat trike was a summer break project born of too much time & too many beers: an old kid’s trike body duct- taped to an engine & battery pack, supplemented with go-cart wheels packed into PVC pipe for better drifting, which after he cruised up the footpath into Bobby’s for a coffee, is exactly what the owner did – drifted & slid with quite an air of expertise long born of practice, all the way down the Ivy Street hill and motored back up again for more. 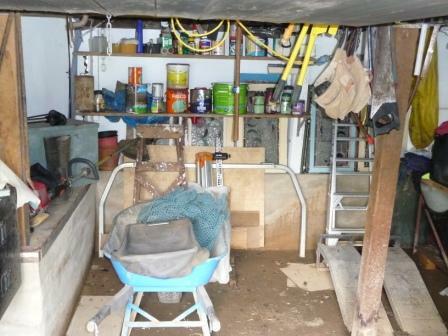 This entry was posted in Blog and tagged Australia, men's shed, Sydney. 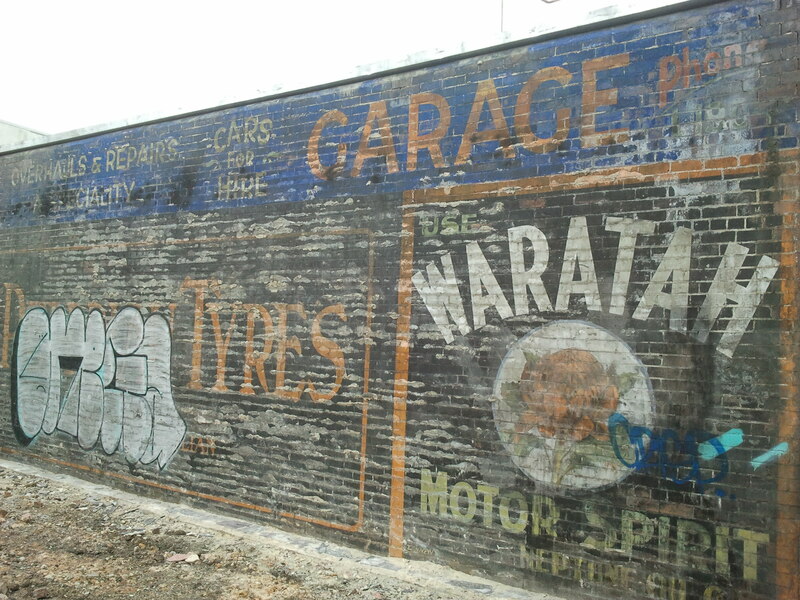 ﻿This street art in King Street, Newtown, (Sydney, NSW, Australia) is a huge example of garage memorabilia. It was exposed late in 2011 when the drycleaners next door burned down and the demolition process brought it into view, and of course some dickhead couldn’t wait to get in there and tag it. 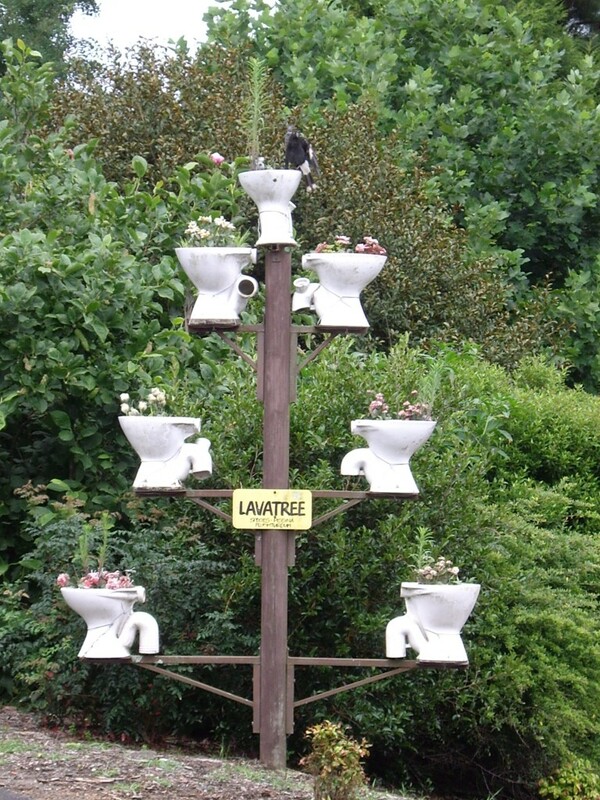 It is however still impressive. 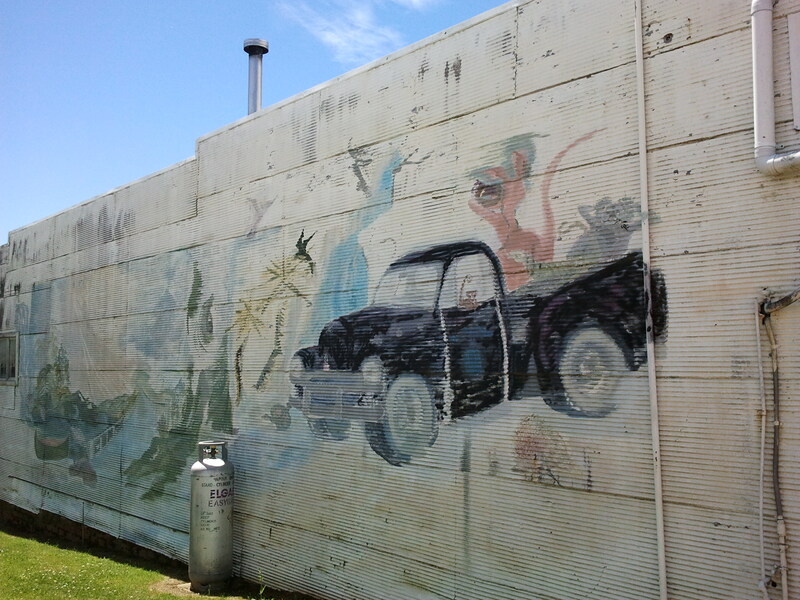 This entry was posted in Blog and tagged Australia, men's shed, Street Art, Sydney.